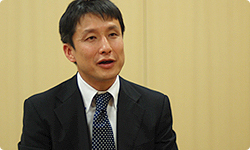 Dr Miyachi, you were kind enough to act as adviser for Wii Fit Plus. Can I ask you to tell me about what specifically you did in this role? I was involved with a number of aspects of the software, but one thing I did was supervise the suggested combination of exercises tailored for people with particular requirements, for instance, people who are trying to lose weight or who want to sleep better at night. 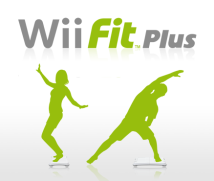 Wii Fit Plus Routines that are tailored to the individual needs of people suffering from ailments such as stiff shoulders or backache. That’s right. It provides the same kind of service which you would get when an instructor gives you guidance in the gym. But in the case of Wii Fit Plus, you can get this kind of advice in your own home, which is something that I think has real value. the number of calories you have burned off . What’s more, this is displayed daily on a graph so that the data is compiled. The human body is incredibly honest – that is to say, if you burn extra calories, that amount of fat will be burned and your weight will be certain to go down. To give a concrete example, there is a clear reaction meaning that if you burn off 7000 calories, you will lose approximately one kilo. So this is a principle that is always obeyed. It’s a principle that’s always obeyed. It’s a principle that however much you struggle, you just can't resist. People who are prone to weight gain often say things like: “Even if I drink water, I put on weight!" (laughs) But there’s absolutely no truth in that, is there? There's absolutely no truth in it. You will put on weight. Put the other way, in order to lose weight, there is no alternative to reducing the amount of calories you are taking in and/or increasing the amount you are burning off. That’s right. This is why I think that having a graph that plots how you are losing weight at the same time as displaying the number of calories you are burning is something that will give real encouragement to the user. So basically the fact that the user can see the reason that they’ve put on weight while also being given encouragement is a real novel approach. In order to allow us to accurately calculate the amount of calories burned off by doing the various training exercises, you were kind enough to carry out the exercise strength measurements. Right. At the National Institute of Health and Nutrition there is a special room known as the metabolic chamber6 where you can measure exercise intensity. We used it to measure each training exercise. 6 Resembling an airtight hotel room, a metabolic chamber is a ground-breaking piece of apparatus which allows long-term measurements to be taken of the amount of energy used by people in an environment close to everyday life. It is also known as a Human Calorie Meter. I've seen video footage many times of the way they used to measure exercise intensity in the past. You'd have someone on a treadmill, and they’d have to wear a mask like the ones worn by pilots of fighter jets while they ran along panting and looking extremely uncomfortable. The reason why those people would wear masks like fighter pilots was because their exhaled breath was being stored directly in a large bag so that it could be analysed. The principle was that by measuring the amount of oxygen in the bag, they could tell how much fat and sugar had been used and therefore how many kilocalories had been burned off. They were measuring the amount of oxygen inhaled and utilised by the body, weren’t they? That's right. 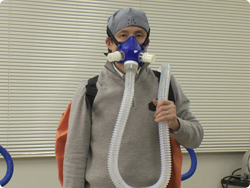 But with the mask on, you could only measure very basic activities such as walking, running and cycling. The mask would have got in the way. That's right. What’s more, you couldn’t do the exercises in a natural, enjoyable way in the way you can with Wii Fit. But as the metabolic chamber at the National Institute of Health and Nutrition measures about 9 metres by 6 metres, we can take measurements with people using it as if they’re playing in their own front room. So in other words, you can obtain more realistic data. Could you tell me more about the set-up in that room? The concentration of oxygen will decrease while the concentration of carbon dioxide increases. Right. So the consumption of energy is measured by means of that change. So that's how you collated the data for all the training exercises on Wii Fit Plus. It wasn’t only Wii Fit Plus. We spent two months collating data from all of the activities on the original Wii Fit as well as Wii Sports. So it took two months to measure all of the activities. What did you discover by doing that? So movements were restricted which meant that the amount of exercise done was reduced as well. By using the metabolic chamber, you can play in a more natural and dynamic way that reveals that even in Wii Fit and Wii Sports, there are a significant number of activities with values of 3 METs or over. METs is a term that people will most likely not have heard before. Would you be kind enough to explain what this term refers to? Certainly. METs is a unit used to measure the intensity when one exercises or moves around. If you don't move, this is measured as 1 MET, and if you ride an exercise bike, for instance, you'll use three times that amount of energy, so it will be 3 METs. Both the American Heart Association and my own exercise guidelines recommend that you do exercises measuring 3 METs or over. 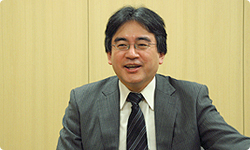 So you’re saying that after measuring the training exercises on Wii Fit, you found that there were a lot that were more than 3 METs. In other words, Wii Fit can really play a positive role as part of a healthy lifestyle. Yes it can. When I found out that even on Wii Fit and Wii Sports, there were a lot that were 3 METs or over, it seems that this made a significant impression on people in Europe and America. That's why in the American guidelines, I believe that in future it will state that just by using Wii Fit and Wii Sports, it is perfectly possible to do the recommended amount of exercise.